I am a big fan of the look of the bass that this shares design elements with. Also I am a sucker for hardtail guitars with contours. Also a sucker for Japanese Fenders. 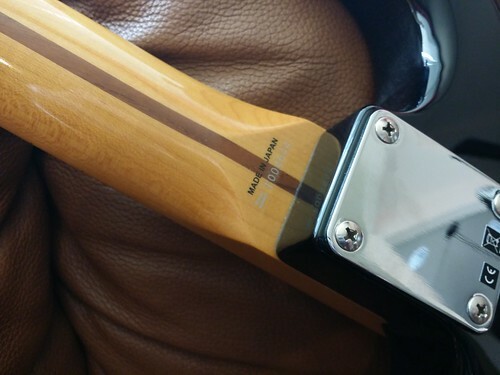 Also a sucker for maple necks. Also a sucker for black and white. Basically I am a sucker for pretty much all this guitar has. No tone knob, just a push pull for humbucker split and a rotary switch for pickup selecting. 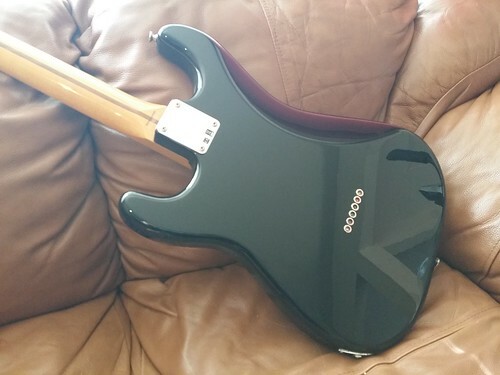 Very comfortable neck and body. I am super pleased. 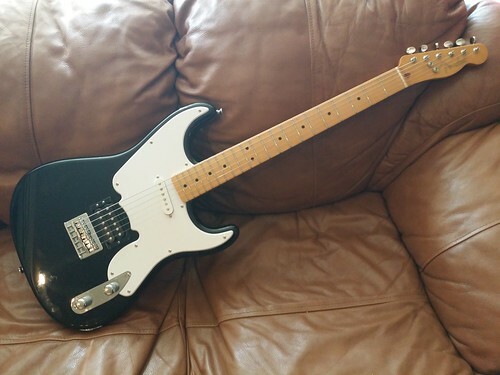 Only thing I think I might do is put a black guard on it with a black neck pickup cover. Stock pickups are very nice sounding in my opinion. Texas Special in the neck and Enforcer in the bridge if I am correct. 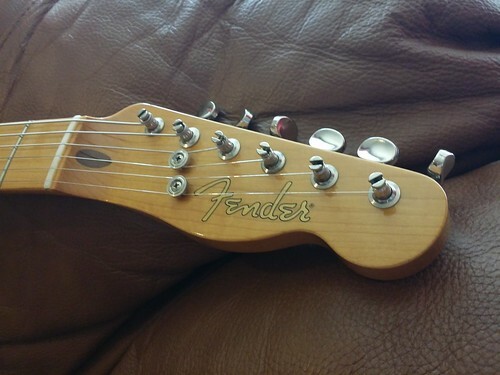 Funny to see Fender not get Klusons mounted straight. Makes me feel better about the ones I have installed. Normally I don't bond with Strats either. I don't know why.... but I do like this. I like 51s, too. Those Klusons are pretty poorly installed. It's actually quite surprising. 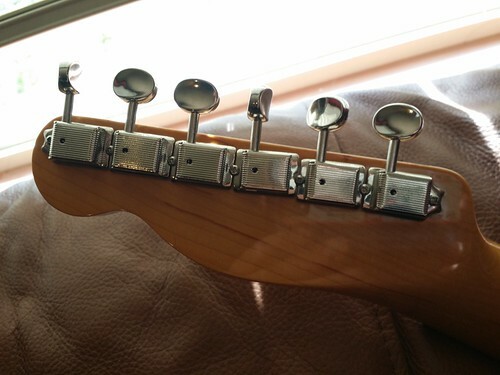 I've always found that the best way to drill for these tuners is to put all six in there and hold something like a level next to the tuners so they're all in a line. I've never failed to drill them straight. Also, if you want a tone knob, there are several options. What I did with my friend's '51 is that I drilled for a 3-way in between the two existing holes. Then, using mini-pots and a short SG-style toggle switch, I had plenty of space for Volume, Tone, and a 3-way in between. It's slightly cramped, hence the mini pots, but I even kept the push-pull (for series/parallel), so there's plenty of space for a lot down there. Or you can always stack a Volume/Tone, but you'd lose the push-pull functionality. I love your guitar's color scheme. It's such a nice contrast, the black and the white. Sounds like some good mods. By the way, your Hello Kitty Jazzy is awesome!! Hardtail Strats are a different beast altogether, I'd love to own a 50s or 70s style hardtail one day. Theoretically this should be pretty close to a Tele? 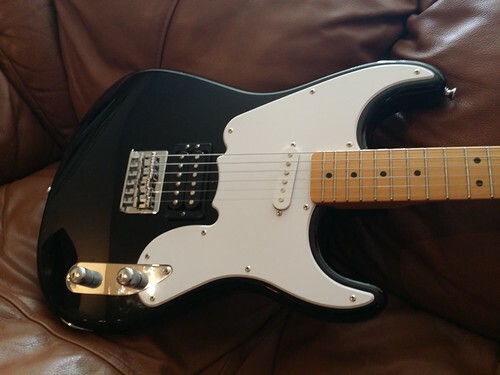 This thread reminded me to pick up my Squier 51 for an hour's worth of Frusciante clean tones. Great fun. 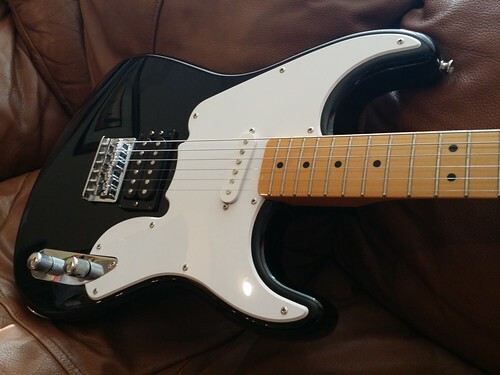 It has a lot of my favorite tele parts, but a strat shaped body. It is pretty cool. Makes me think of the stuff Andrewdoeshair made in the day.